As we come to the end of 2016, we thought there would be no better way to round off the year than to give you guys the opportunity to try out Nier: Automata yourselves. It’s the season for giving, after all, so we’re excited to announce that the Nier: Automata playable demo is available to download from the PlayStation Store for free later today! The demo takes you to an abandoned factory, following android 2B’s mission to destroy a massive enemy weapon that lies within. You’ll get to use a variety of both short and long range weapons to take down hordes of enemy machines. The combat is action-packed, fast-paced, super slick, and there are multiple difficulties — so once you’ve got the hang of things, you can really test and refine your skills. I’d be very impressed to hear how many of you can complete the demo on the hardest difficulty! Eagle-eyed Square Enix fans have probably already figured out what the new weapons are the Engine Blade — Noctis’ signature weapon in Final Fantasy XV — and the Cypress Stick from the Dragon Quest franchise. They will both be unlockable in the final game so you don’t have to worry about downloading them as additional DLC. We’re going to keep how you obtain them a mystery for now, though. The news doesn’t stop there though! From today you can also pre-order the Nier: Automata Day One Edition directly from PlayStation Store. In addition to the Day One Edition six bonus DLC items, the PSN digital pre-order edition also comes with an additional three exclusive DLC items and a static theme. 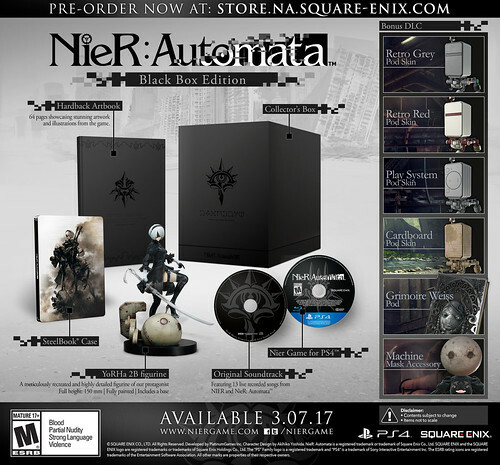 In case you missed the news, we also recently announced the Nier: Automata Black Box Edition which includes a YoRHa android 2B figurine, a 64 page hardback artbook, a soundtrack selection CD (featuring 13 live recorded songs from Nier and Nier: Automata), in-game bonus DLC, a steelbook case, and special collector’s box. It’s available in limited quantities from the Square Enix Store so be sure to pre-order one if you don’t want to miss out. Nier: Automata tells the story of androids 2B, 9S, and A2, and their battle to reclaim the Earth from powerful enemy machines who have driven humanity from their home. 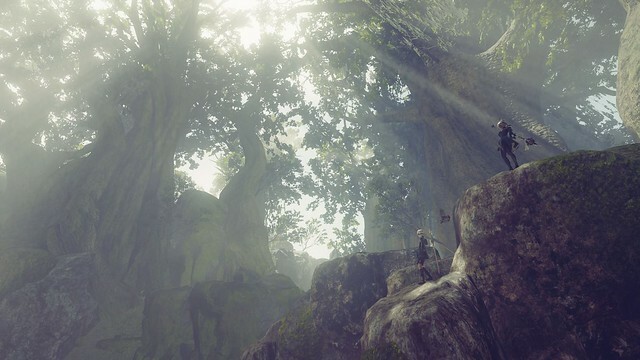 The demo will give you a glimpse of the game’s story, and there’s a lot of spectacular moments with distinct Nier style twists in it, too. I don’t want to spoil any of it for you as they’ll be even more exciting to experience yourself, but I hope the demo gets you hyped to play the full game when it comes out on March 7, 2017. I think that’s enough news for one day. Hopefully you’ve been able to download the demo so you don’t have to stick around here any longer, go play it and let us know what you think afterwards! Thanks for reading, and from the Nier: Automata team — Happy Holidays!